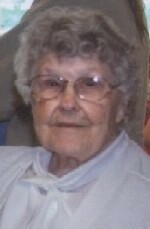 OSWEGO, NY – Theresa Barbara Smart, 88, a resident of County Route 64 in Mexico, passed away Thursday July 22, 2010, in Oswego Hospital, surrounded by her family. Mrs. Smart was born in Oswego on Oct. 17, 1921, the daughter of the late George and Mary (Coad) DeLong. On Feb. 15, 1942, she was married to Charles Smart. Mr. Smart passed away in 1996. During World War II, she worked as a certified welder at the FitzGibbons factory in Oswego. She had also been employed at Coleâ€™s Laundry in Oswego. Mrs. Smart enjoyed knitting, crocheting, reading, playing bingo and watching old movies. She was a caregiver for many family members. She belonged to the Senior Nutrition Program in Mexico and was a communicant of St. Anne Mother of Mary Church in Mexico. She is survived by four sons, Charles (Jean) Smart of Antwerp, George (Mary) Smart of Mexico, Michael (Gina) Smart of Mexico and Harold (JoAnn) Smart of Mexico; a brother, Richard (Theresa) DeLong of New Haven; eight grandchildren, Christine, Andrew, William, Karen, Michelle, Daniel, Harold Jr. and Luke; eight great-grandchildren; and several nieces and nephews. In addition to her husband and parents, she was predeceased by a son, Lawrence; three brothers, Fredrick, George and William DeLong; and a sister, Mary Campbell. Funeral services will be held at 11 a.m. Tuesday in St. Anne Mother of Mary Church in Mexico. Burial will be in St. Peterâ€™s Cemetery, Oswego. Calling hours will be held from 4 to 7 p.m. Monday at the Dain-Cullinan Funeral Home, 112 E. Second St., Oswego. Contributions can be made to St. Anne Mother of Mary Church in Mexico.